If you feel our work is important, if we have helped you in the past, if you know anybody that might benefit from our help, please help us raise fund to support our group! We have been running since May 2018 the Café with no funds other than your donations. As LLL Leaders, we give our time and commitment enthusiastically. We embrace this work because we feel passionately about empowering breastfeeding mothers through their journeys and the importance of mothering through breastfeeding. However, we do rely on your generous voluntary donations to pay for the costs associated with running the meetings (teas and healthy snacks, growing our lending library/leaflets, training/education for our leaders so they are up-to-date in their knowledge, training/mentoring for mothers that want to become leaders and last but not least paying our new venue). 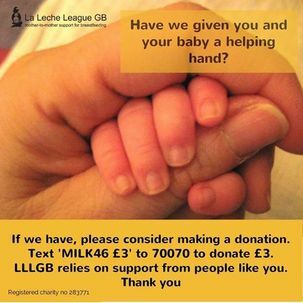 We, therefore, invite you to join with us in this important work by taking out a membership from our Local Cafe La Leche Merton group (as we get a percentage) and/or sending us a donation (we now do have a bank account!) and thus ensuring that you can help us help the next mother and baby in need, just as we were there for you when you needed help. Last but not least, we are very excited to tell you that we have two new fundraising methods! 1. Whenever you buy anything online - from your weekly shop to your annual holiday - you could be collecting free donations for Café La Leche Merton in Wimbledon. Head to https://www.easyfundraising.org.uk/causes/lalecheleaguewimbledon/ and join for free.